Have you ever heard of the Global Lounge? The Global Lounge is a place where UOS students can go to study foreign languages and share different cultures. Located on the 4th floor of Changgong Hall, the Global Lounge is always full of students who are eager to have conversations with foreign students. 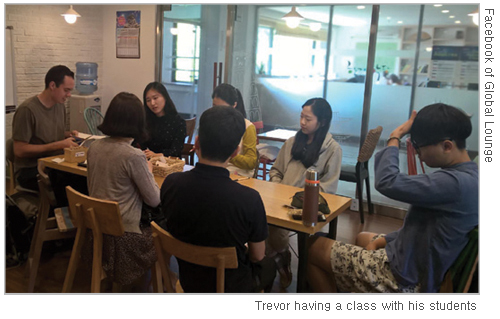 In this cafe-like comfortable place, students who want to practice different languages can improve their skills, and also get along with others from diverse countries and cultures. For those who want to visit the Global Lounge, it is open from 9 a.m. to 5:30 p.m. However, students ? especially Korean students ? are hesitant to step into the lounge. “The [Korean] students usually stand in front of the door, staring inside” Isaac, one of the lounge keepers, said when asked whether the Korean students visit the place often. “It seems like they need someone to grab them to come in.” But, you do not need to worry even if you think that you are not brave enough to talk to a foreign student. You can just sign up for the regular programs held in the lounge instead! The Group Study is one of the programs that the lounge currently holds, in which exchange students teach their mother language to UOS students. This program offers tutoring in various languages: English, Japanese, Spanish, and French. 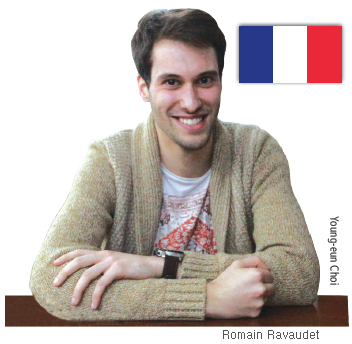 The UOS Times interviewed two exchange students, Romain (R) and Trevor (T), who are working as tutors in the Global Lounge. Q 1 What made you to do this tutoring program? R It means a lot to me to share culture with others. 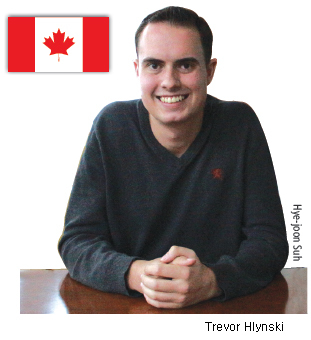 Sharing culture, in this case, language will help people know my country. And also this could be a chance for me to learn much more about Korea, as well. Q 2 How do you teach French and English in your classes? T Since my students have basic English skills, I do not use a text book or board. And as I want students to talk in English with confidence, we just have a daily conversation which could lead students to speak up in English. Sometimes we have a language game. This is much more fun than just giving students lectures. R Opposite to Trevor, my students have never learned French. So it is impossible for us to talk in French or play a game. Therefore, I usually teach them basic vocabulary and practice dialogues. I use a board when I teach them so that all the students can better follow what I teach. Q 3 Is it ever difficult to teach students as a foreigner? T It is hard to let students speak up English even though they how to speak English. Like most Koreans, my students are also worried about making mistakes. For example, students can write a text-message so fast in English but they hesitate or even don’t try to speak out. Helping students have confidence to speak English is the hardest thing. R We have the same obstacle as Trevor has. It is really hard to get students talk in French, even just a sentence or word. As I mentioned, French is not familiar and most of my students have never learned French. Therefore we usually use English with students in class. This, however, causes problems when some students cannot understand English. So in class, we need to translate it twice, first into English and then into Korean. Therefore, conversation between my students and me is the most difficult thing. Trevor and Romain are exchange students from France and Canada. Since they are from Europe and North America, their cultures are rather different from Korea’s. Q 4 How is your life in Korea as a foreigner? R In the UOS, I do not feel that I am a stranger because there are a lot of exchange students. Outside the UOS, however, so many people see me as a different person. Old people sometimes stare at me, not caring how I feel. In France there are so many cultures and races mixed up, so we never stare at a foreigner just because he or she looks different. That experience was weird, and it is quite a rude thing to do. T In one case, someone took a picture of me without permission. They just took it and were gone. That was a shock to me. Another thing that astonished me as a foreigner was how complicated it was to get to Hoegi! It is really complicated. We usually call it the Hoegi maze. I could not understand how big cars could pass along the road all the way to Heogi. Other than these, Korea is such a nice place. For instance, I once went to Gyeongbok palace with Seoul mates, and it was fantastic. If I have a chance, I would like to visit other places in Seoul or in Korea. R I went to Busan with my friends on Chuseok. People said that it would take a very long time by bus, but fortunately it didn’t. When we arrived at the ocean in Busan, we could watch sunrise, which was really beautiful. And Korean food! I was startled by the variety of toppings on the pizza! In France there are just simple toppings, and the pizzas are thin. In Korea, I can try different pizzas from those I usually eat in France. Q 5 Can you give any advice to UOS students who want to improve their language skills? R T If you want to improve a foreign language, you should be confident about yourself when you talk! It is okay to make mistakes, since not many foreigners can remember errors that you make from a conversation. Do not be afraid of speaking English. Mistakes can also make your language skills better. And strike up a conversation with exchange students. They are here to share their culture and learn about Korea. 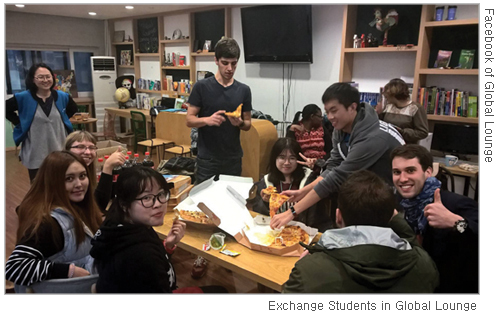 Therefore, exchange students or keepers in the Global Lounge are willing and happy to talk with Korean students! And last… reading The UOS Times will also help them improve their English.